Would you like to save space on you hard drive, but you can't do without any of your favorite songs? Do you want to increase your multimedia player's storage capacity? 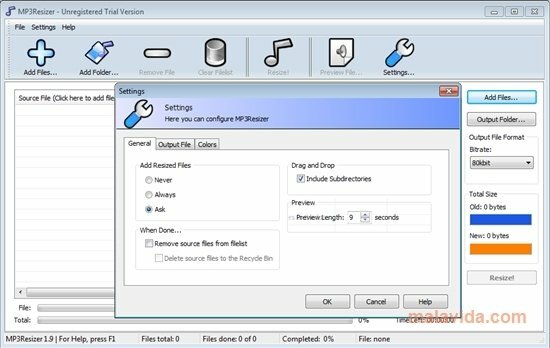 MP3Resizer reduces the size of the MP3 files so that you can make better use of the free space on your hard drive. 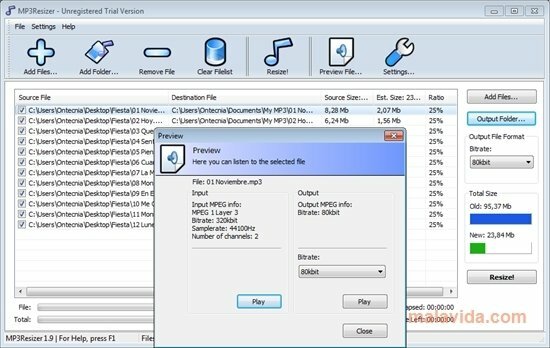 By means of a very simple and intuitive interface, this program can reduce the size of your music collection to half its original size. As is logical, this change in size is in exchange of sacrificing sound quality, because we'll have to reduce the kbps as well as the kHz. When we select one or more songs, MP3Resizer will show us the current size and the size it would have if we convert it with a set of preset output parameters. Playing with the parameters we'll be able to find the ideal size that we want our music tracks to have, at the same time that they maintain the minimum quality necessary for us to enjoy listening to them. The program performs the conversion at great speed, following the conversion queue of the elements that we programmed to be converted. A utility for music lovers in need of free space on their hard drives.